Cedric and the Revolution is a charming and very well-designed freeware adventure game. Although it is on the short side, you will have so much fun with the witty dialogues, humor, and clever puzzles that you will be sad to see it end. Set in a fantasy town, you "...follow the adventure of Cedric and Victor as they try to get a demonstration up and running." 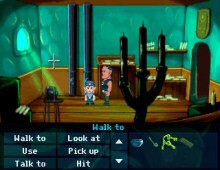 The game is well-written, the storyline is interesting, and the puzzles are a lot of fun to solve and will make gamers fondly recall the early 90s - heyday of adventure gaming. The catching-the-hat puzzle is my favorite in the game, but there are many other memorable puzzles - a wonderful achievement given the relatively short length. If you have even a slightest interest in adventure games, Cedric and the Revolution is one of the must-play and overlooked underdogs of 2005. Don't let the freeware status fool you - everything in this game is commercial-quality, and had it been 2-3 times longer, could have been easily marketed as such. A must-have, and a high five to designer Bernhard Politsch for creating such a captivating game.